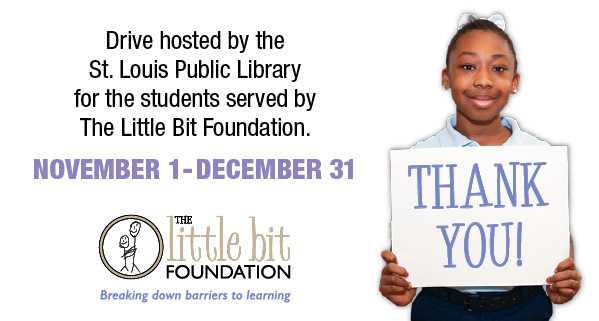 St. Louis Public Library is partnering with The Little Bit Foundation to collect socks and underwear for area children and teens. Donations can be dropped off at any SLPL location from November 1 through December 31. Only new socks and underwear will be accepted, and items must be in the original package or have a tag attached. The Little Bit Foundation organizes programs and services throughout the area and in many school districts that support performance goals and addresses the needs of the whole child – body, mind, and spirit – so that they can focus on their education.